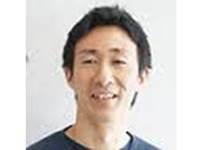 The following story is filed by Mr. Masakuni Tanimoto, Deputy Secretary-General of the Global Peacebuilding Association of Japan. 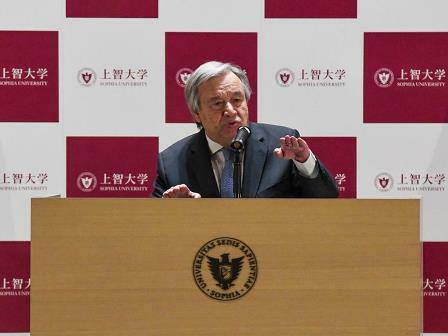 During his one day visit to Japan, UN Secretary-General António Guterres met with a group of members of the Diet of Japan and Prime Minister Shinzo Abe, and made speeches at the meetings of the Universal Health Coverage and the Sophia University University. 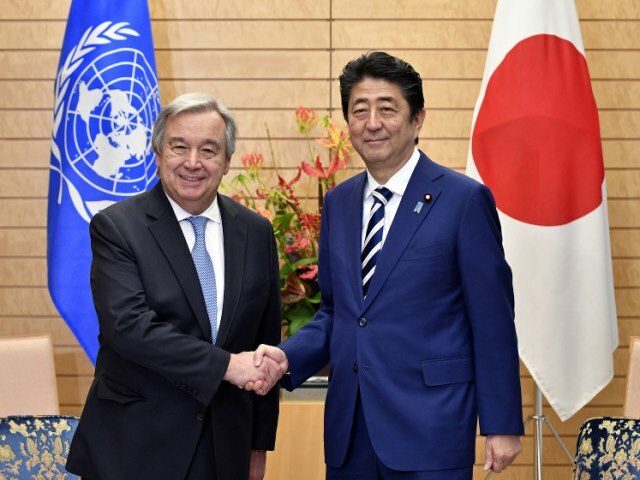 Secretary-General António Guterres was received well by Prime Minister Shinzo Abe who spent more than three hours meeting and having lunch with the Secretary-General. Meeting with Prime Minister Abe. According to the UN Press release, speaking to the press afterwards, the Secretary-General said that Japan is a pillar of the international system and thanked the Government for its strong support to the UN in many fields. Mr. Guterres also underscored Japan’s leadership in human security which, he said, reflected his own priority on prevention and sustainable development. Regarding the situation on the Korean Peninsula, the Secretary-General underscored the need for the full implementation of Security Council resolutions by the Democratic People’s Republic of Korea and all other countries. He called for the unity of the 15-member body on the aim of denuclearizing the peninsula as well as the need to allow for the possibility of diplomatic engagement to peacefully achieve that objective. Please refer to http://www.un.org/apps/news/story.asp?NewsID=58288#.WjR7R9FG1mW. The Secretary-General delivered a lecture, titled “Global Challenges: The Role of Human Security,” at Sophia University. 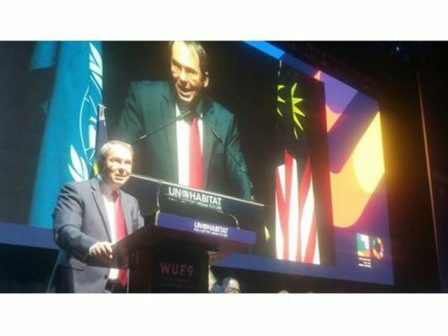 In his speech, Secretary-General Guterres first identified three challenges facing the world. They were (1) nuclear threat, (2) global terrorism, (3) climate change and (4) increased income inequality. In addressing these challenges, he stressed the importance of conflict and crisis prevention. He also touched upon such issues as population movement, refugees, artificial intelligence, and civil society. 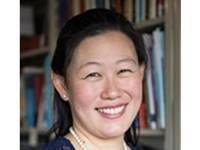 The nuclear threat posed by North Korea poses the danger of disintegration of the non-proliferation regime. Global terrorism is rampant in many areas of Africa, the Middle East and Western Asia. The climate change is accelerating and its negative impact is felt globally. Eight richest man of the world now has asset equal to the lowest 30 percent of the global population. Secretary-General Guterres then noted the increasing relevance and importance of the concept of human security in addressing the humanitarian crises. 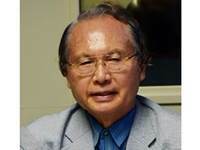 The doctrines of humanitarian intervention and the responsibility to protect (R2P) helped guide the international community in the 1990`s and the first decade of the new century. 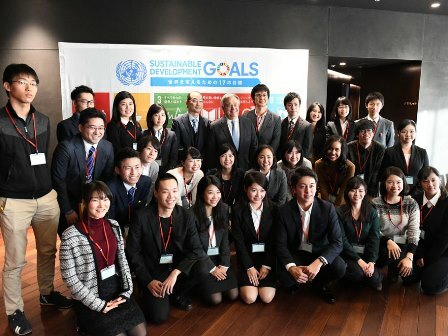 The visit of Secretary-General Gutteres to Sophia University had been arranged by Professor Daisaku Higashi who introduced the Secretary-General to the students and invited guests at the Sophia University. Earlier in the day, Secretary-General António Guterres met with a group of members of the Diet of Japan, including State Minister for Foreign Affairs Kazuyuki Nakane. 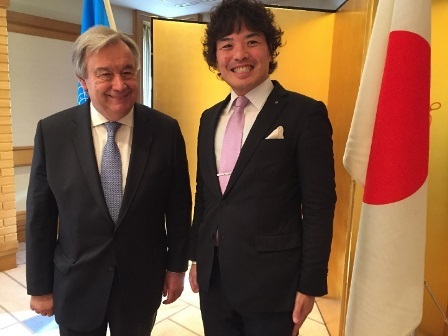 During the morning session with members of the Diet of Japan, UN Secretary-General António Guterres met briefly with Mr. Masakuni Tanimoto, Deputy Secretary-General of the Global Peacebuilding Association of Japan.